Roseanne Barr for president campaign button. Photo from Roseanne for President! Facebook page. 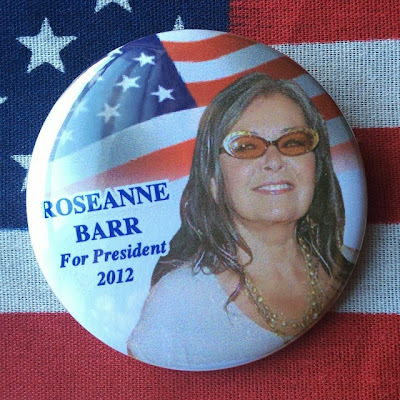 AMONG her many accomplishments, Roseanne Barr has been a candidate for the presidency of the United States. Surprisingly, many are unawares, but in 2012 the comedian-mogul ran for the highest office in the land against incumbent Barack Obama, Mitt Romney, Dr. Jill Stein and others. Meanwhile, friendships are fragile things. They are difficult to build, and maintaining them can be as tricky as keeping a house of cards from collapsing. Why then, is human nature such that we too often endanger these very special bonds. For instance, if one has a perfectly good friendship, is it not madness to burden it with a complication such as a romantic kiss – even if it is only for research? Of course, it is. Yet, Daniel (Roberto Cavazos) and Ale (Ana Gonzalez Bello) go down this slippery slope in “The Kiss” (“El Beso”). The film by Carlos G. Davila is also on the Tribeca schedule today and Saturday in its U.S. premiere. The Monterrey, Mexico native is also an architect. Alas, his heart was elsewhere. He'd go on to study film – "I said it was now or never" – and has directed commercials, music videos and TV shows. “There are many similarities between architecture and filmmaking,” he says. "The Kiss" of death between Daniel (Roberto Cavazos) and Ale (Ana Gonzalez Bello)? Photo from "The Kiss" Facebook page. How the players keep a straight face during these proceedings is a testament to their acting abilities. Cocooned in CGD's hovering, in-your-face lens, their reactions and interactions are utterly authentic. Films/events on today's TFF2015 schedule: "Tribeca Talks Master Class: Dolby Institute The Sound of the Coens," "The Armor of Light," “Far From Men,” “Steak (R)Evolution,” “Shorts: Gallery Opening,” “Roseanne for President,” “Orion: The Man Who Would Be King,” “The Driftless Area,” “Sunrise,” “Stranded in Canton,” “Among the Believers,” “Havana Motor Club,” “All Eyes and Ears,” “Song of Lahore,” “Shorts: Tightrope,” “On the Town,” “Apple Store Panel: Far From Men,” “Sworn Virgin,” “The Overnight,” “Havana Motor Club.” and “Lucifer.” (See video above).